Autumn is my absolute favourite season for cooking, because I can pull out my slow cooker and let it work its magic on our weekly meals! Stews, soups, slow-cooked roasts, and of course… pulled pork! I discovered the deliciousness that is pulled pork as an adult, thanks to my husband’s Mexican roots. 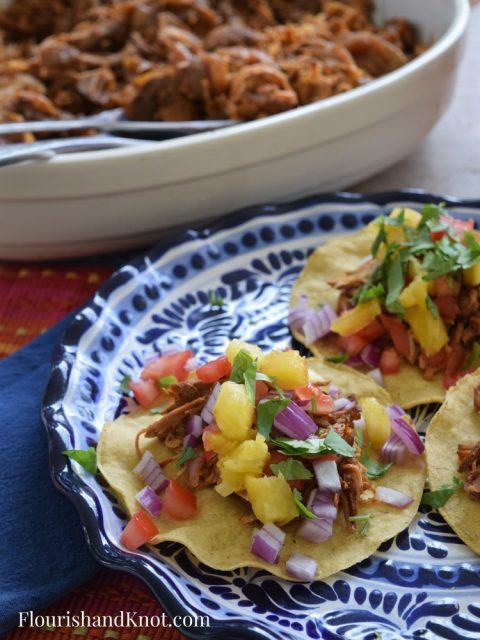 There are many variations on Mexican pulled pork, but the most famous is probably cochinita pibil, a specialty from the Yucatan. I’m really happy to be joining ten other Canadian bloggers to pull together a giant round-up of our very best slow cooker recipes for fall. These are the ones we always turn to when our families want comfort food, or when we have a big crowd showing up for dinner! You’re getting the best of the best in this hop. 🙂 Special thanks to Jo-Anna from A Pretty Life in the Suburbs for pulling this event together. Cut the onions into large slices and line the bottom of the slow cooker with them. Cut the pork into large cubes (a 3 1/2 lb pork shoulder should be cut into about 6 large cubes/pieces) and put them on top of the onions (including the bone). To make the marinade, first bring to a simmer the orange juice. Add the achiote paste and allow it to dissolve in the orange juice. Meanwhile, mix all the other marinade ingredients in a bowl. Add the orange juice-achiote mixture and pour it over the pork and onions. Cook in a slow cooker on LOW heat for 8 hours. When it’s done, remove the pork and onions from the leftover juice and shred. Add a bit of the leftover juice and serve! 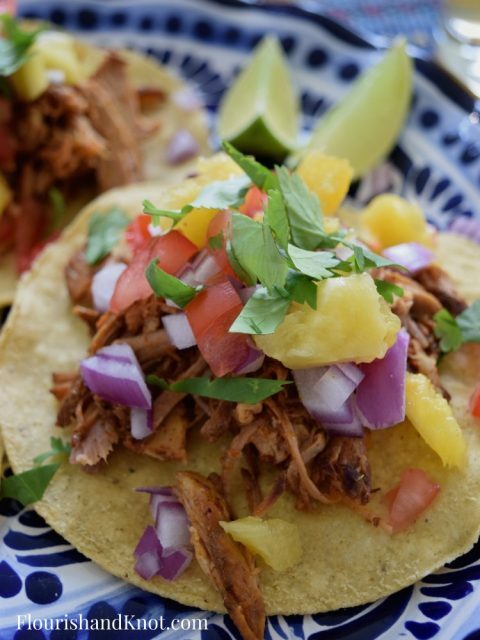 I like to serve my cochinita pibil as tacos al pastor, which are pork tacos with onion, pineapple, salsa, cilantro, and lime. Adding some tomato is also great! 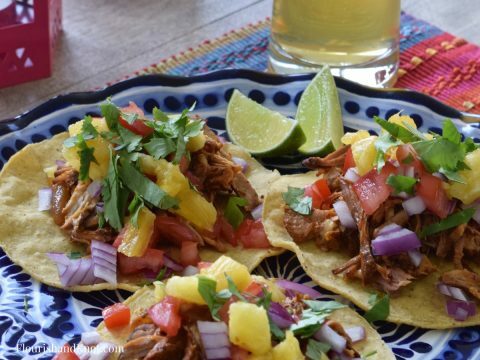 I served my cochinita pibil on tostadas (which are crispy corn tortillas), because we have trouble finding proper corn tortillas in our area (and the flour ones Just Won’t Do). Not as perfect as hot corn tortillas, but not bad either – and a great way to serve this to a lot of people! 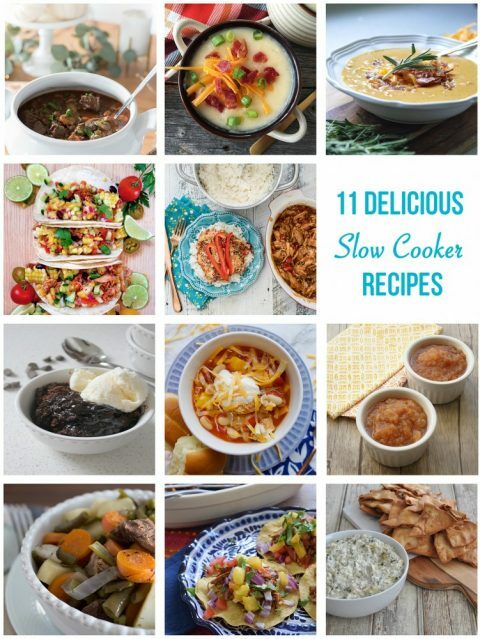 Take a moment and visit all the other amazing bloggers who are participating in this slow cooker hop. You can fill your weekly menu just with this hop! Hooray for tried-and-true recipes! These look great Sarah! I love the idea of serving them on tostadas! Pingback: Slow Cooker Beef Stew - Simple to Make & Delicious!